When construction disputes occur between general contractors and sub-contractors, construction companies, property owners or other parties, it may seem difficult, expensive and time-consuming to resolve those disputes in a satisfactory manner. While some of these disputes may be resolved through cooperation or other mediation methods, others will only be resolved through construction litigation or construction arbitration. At the law firm of Kushnick Pallaci PLLC, our attorneys utilize their years of experience in construction litigation to represent a wide range of clients in construction law disputes across the State of New York. 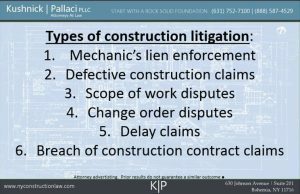 Construction litigation is a broad term that includes lien foreclosure actions, breach of construction contract claims, defective construction claims, delay claims, scope of work disputes and more. Kushnick Pallaci PLLC has successfully represented general contractors, prime contractors, sub-contractors, sub-sub-contractors, construction managers, owners, developers, architects and engineers in construction litigation matters ranging from small payment disputes to multi-million dollar litigation at all levels of the New York state trial courts as well as is Federal Court. Our construction lawyers take pride in helping our clients obtain successful resolutions that are cost-effective and meet their needs. We understand that litigation is never a desirable outcome, but we understand that strong and swift enforcement will get you paid or protect you from paying too much. In the increasingly complex world of construction, litigation of claims is becoming more common and more necessary. 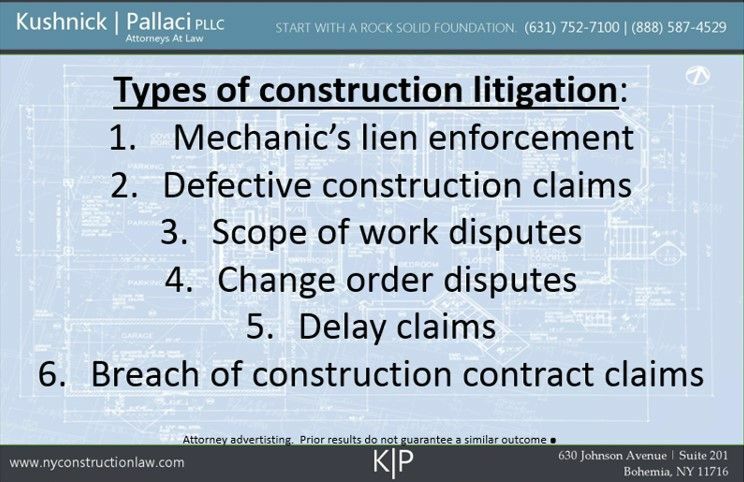 Construction litigation disputes can involve simple non-payment under the contract and can be resolved through breach of contract actions, Prompt Payment Act actions, mechanic’s lien foreclosure actions or a combination of all three. But construction litigation also involves a vast array of other disputes frequently encountered on the job site including claims over defective work, scope of works disputes and delay or acceleration claims. 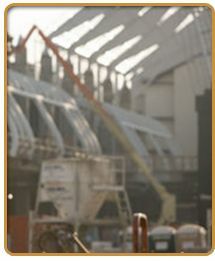 Our construction lawyers have extensive experience in all types of construction claims and regularly handle disputes involving private commercial projects such as retail stores, restaurants, hospitals and hotels; residential developments, including cooperative and condominium construction; and public projects, including schools, bridges and waste and water treatment facilities. Because of our familiarity with the construction industry you don’t have to spend time teaching us construction before we can discuss the law with you. We know how construction projects work from contract negotiation through project delivery and every step in between. This knowledge and dedication to the construction industry allows us to develop a strategy to protect and enforce your rights as quickly and cost effectively as possible. If you are involved in construction litigation in New York contact the construction attorneys at Kushnick Pallaci PLLC now for a free consultation with one of our dedicated attorneys to see how we can help you. Contact us at Kushnick Pallaci, P.L.L.C. at 631-752-7100 or toll free at 1-888-KUSHLAW (587-4529) to schedule a free initial consultation.